Why Is Chad On Trump's Travel Ban List? : The Two-Way The Central African country has good relations with Washington and has been a partner in the regional fight against terrorism. Chadians are puzzled. 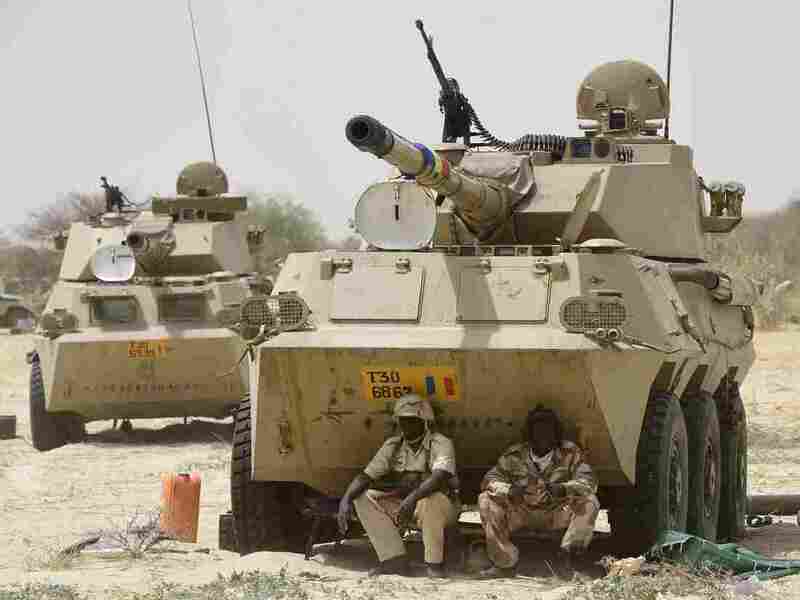 Chadian soldiers rest in the shade of their armored vehicle near Malam Fatori in April 2015, after troops retook the town from Boko Haram. When the White House issued its amended travel ban over the weekend, it added three countries to the list: North Korea, Venezuela ... and Chad. That's angered the government of the Central African country and perplexed policy analysts and political observers outside the Trump administration. "Chad is totally puzzled and baffled by President Trump's decision to slap this ban on Chadian nationals," NPR's Ofeibea Quist-Arcton tells Morning Edition. "Chad is not happy, because it feels that it has done its utmost in the fight against terrorism." And the language issued by the White House in the president's executive order has done little to clarify the rationale. It praises Chad for being "an important and valuable counterterrorism partner" and says Washington "looks forward to expanding that cooperation." Nonetheless, the executive order also states that "Chad does not adequately share public safety and terrorism-related information" and "several terrorist groups are active within Chad or in the surrounding region, including elements of Boko Haram, ISIS-West Africa, and al-Qa'ida in the Islamic Maghreb." Libya is among the eight nations under restriction in Trump's order. But other neighboring countries such as Nigeria, the base of Boko Haram, aren't on the list. And Sudan — one of only three countries on the U.S. list of state sponsors of terrorism — had been on a previous list but was dropped in the latest version. "Chad played a significant role in [fighting] Boko Haram from northeastern Nigeria. And pound for pound, the Chadian military is one of the toughest around, particularly in West Africa," John Campbell, the former U.S. ambassador to Nigeria during George W. Bush's administration, tells NPR's David Welna. As NPR's Arnie Seipel has reported, "The new restrictions on Chad and North Korea are a broad ban on nationals from those countries entering the States. For Venezuela, restrictions apply to government officials and their immediate family. These changes are set to take effect on Oct. 18." Chad has issued a statement asking Washington to reconsider, saying the decision to place it on the list "seriously undermines the image of Chad and the good relations between the two countries." "The Chadian Government expresses its incomprehension in the face of the official reasons behind this decision," the statement added. 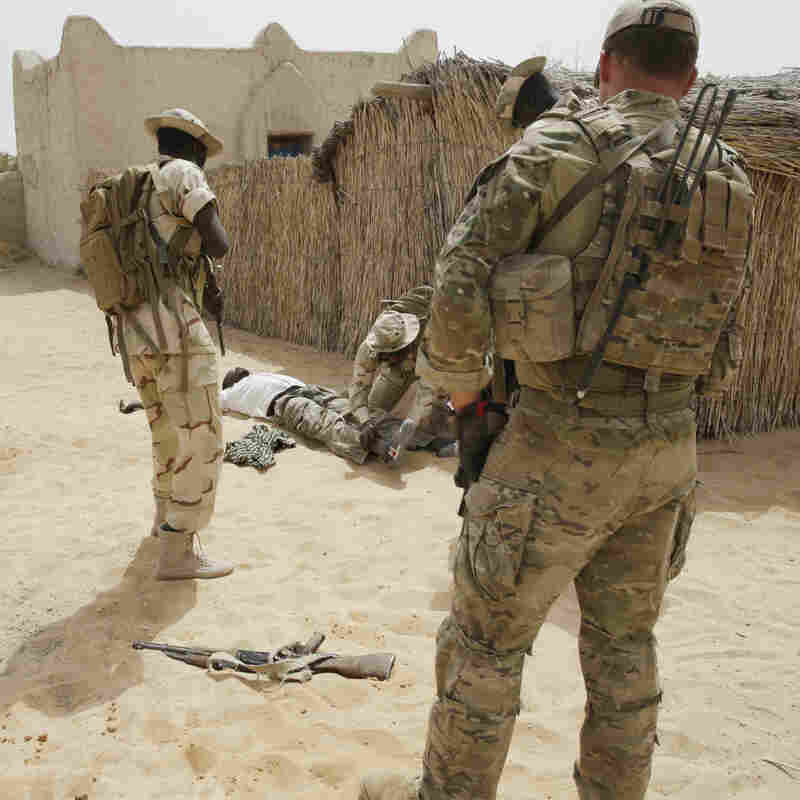 A U.S. special forces soldier (right) watches as Chadian troops and Nigerian special forces take part in a hostage rescue drill at the end of the Flintlock 2015 military exercise in Mao, Chad. As Ofeibea points out, as recently as March, Chad and the U.S. participated together with other African countries in Flintlock 2017, the latest iteration of an annual joint military exercise aimed at strengthening ties and counterterrorism efforts. "I was there. I met [U.S. Ambassador Geeta Pasi], who talked enthusiastically about relations with Chad," Ofeibea says. "It's bewildering," Reed Brody, a human rights lawyer who has worked in Chad, tells The Atlantic. "I've been trying to explain to Chadians that there's no reason." There have been questions as to whether Chad's inclusion might have something to do with oil. Chad had accused Exxon Mobil, which exports crude from Chad, of not meeting its tax obligations to the African state. The Chadian government sought a whopping $74 billion fine in addition to $819 million in overdue royalties. Ofeibea says people are wondering whether the inclusion of Chad is meant as "an arm-twister." Adding to such speculation is the fact that U.S. Secretary of State Rex Tillerson was the chairman and CEO of Exxon Mobil before joining the Trump administration. In any case, Exxon and Chad reached a settlement in June.